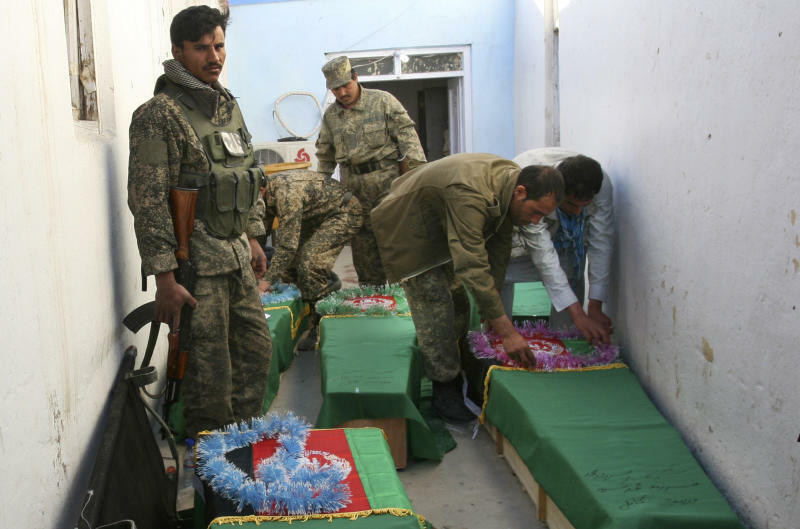 KABUL, Afghanistan (AP) — Roadside bombs and insurgent attacks killed at least 24 people in five separate attacks across Afghanistan as violence steadily rises during this year's spring fighting season, officials said Wednesday. So far, April has been the deadliest month this year for Afghan and foreign civilians and security forces. According to an Associated Press tally, 182 people have been killed in violence around the nation this month. In western Afghanistan, seven women and children died when their truck hit a roadside bomb near Shindad in Herat province, said Muhiudin Noori, a spokesman for the governor. In the east, another roadside bomb killed five men who were part of a government security force guarding a convoy of trucks in Ghazni's Qarabagh district, provincial spokesman Fazel Ahmad Sabaoon said. Also in the east, insurgents attacked a checkpoint in Laghman province, killing four village policemen, provincial spokesman Sarhadi Zawak said. In northern Jowzjan province, police chief Aziz Ghayrat said insurgents opened fire on elders in a village and two health workers were killed in the crossfire. Also on Wednesday, six Afghan soldiers — two officers and four enlisted men — were found shot to death on a main highway that crosses Jowzjan, police spokesman Abdul Mannan Raoufi said. He said the six had just left their military unit and were headed home for a break to visit their families. He blamed the attack, which he said occurred on Tuesday, on Taliban insurgents. AP writers Rahim Faiez and Patrick Quinn contributed.